Tales of the Abyss (テイルズ オブ ジ アビス, Teiruzu obu ji Abisu?) is a console role-playing game developed by Namco Tales Studio and published by Namco in Japan and Bandai Namco Games in North America. It is the eighth mothership title in the Tales series, and was released for the PlayStation 2 on December 15, 2005 in Japan, celebrating the Tales series' 10th anniversary, and on October 10, 2006 in North America. It was ported to the Nintendo 3DS in 2011 and later released on the Nintendo eShop in Japan on December 3, 2014. 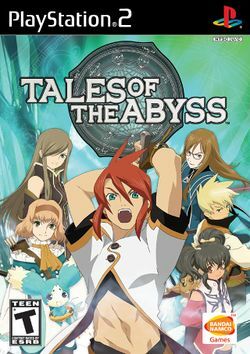 Tales of the Abyss' characteristic genre name is RPG to Know the Meaning of Birth (生まれた意味を知るRPG, Umareta imi o shiru RPG?). It features the Flex Range Linear Motion Battle System, which most resembles Tales of Symphonia's. The character designs are by manga artist Kosuke Fujishima. Tales of the Abyss takes place on Auldrant, a planet composed of elementary particles called Fonons (フォニム, Fonimu?, Fonim in the Japanese version). For much of Auldrant's history, only six fonons were known to exist, representing the elements of Shadow, Earth, Wind, Water, Fire and Light; but eventually a seventh fonon, controlling Sound, is discovered. Its discovery brings great chaos: using this newest Seventh Fonon allows one to read the future. One such Seventh Fonist, Yulia Jue, an important religious figure in the game, puts in place a future for the world for thousands of years to come, with the promise of unlimited prosperity at its end. This prophecy of the future's set path becomes known as the "Score" and is documented on "Fonstones" scattered throughout the world. The nations of Kimlasca-Lanvaldear and Malkuth have fought over the fragments of these tablets for generations, each uncovering them and hoping to discover the future before the other. Meanwhile, a holy order emerges dedicated to the reading of the Score and the keeping of the peace. This "Order of Lorelei" is headed by a Fon Master and maintains both religious/political and military branches. Finally, the Score and its promise of prosperity lead to a dangerous complacency within the general population of Auldrant; the slaughter of an entire people living on the island of Hod and the destruction of that landmass are countenanced because it was predicted in the Score. This page was last edited on 15 March 2016, at 19:03. This page has been accessed 11,137 times.